I'm not particularly religious, however, I do like celebrations in which families and friends get together. The plant-in-an-egg idea is not completely original as I've seen it at Eggling, but I wanted to make my own version to give to my friends. Yes, I've become "disgustingly" Martha Stuart as my family keep saying, but I enjoy crafting. If you're reading this post Stef: Keep your trap closed. I don't want to know what you "think" of my ideas. They're genius ^_~. My Nana told me that when she was a little girl, they didn't get chocolate eggs, they got hard boiled eggs which they painted and rolled down hills until they cracked. It's an endearing thought. The point of my story is that Easter is more than chocolates and fluffy bunnies. It is the start of new life! The Egg represents creation and a little plant inside symbolises new life. 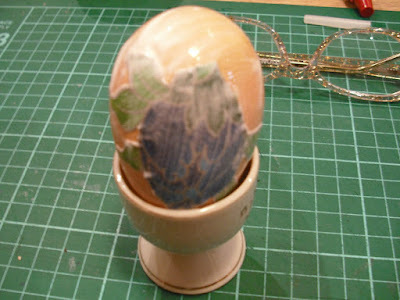 My version of this idea is to decoupage the shell to make it more treat-like. I also intend to make it 100% organic and dirt cheap (literally!). So anyway, on to it. 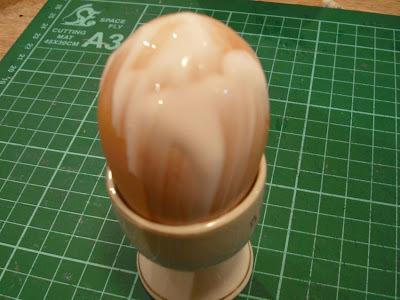 Egg shell: Use a egg-intensive recipe to get lots of eggs at once. Alternatively just collect them over time, but I prefer to have everything organised before I start. 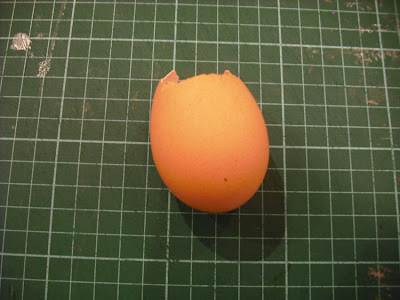 When you crack the egg, use the edge of a knife and give a hard tap---don't hesitate! I've found that multiple hits fracture and weaken the structure of the shell. Aim to remove one third of the shell or less if possible. 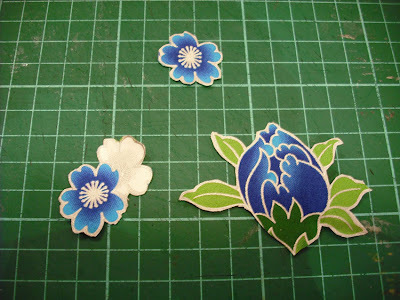 Something to stick on shell: I'm using these flower pictures which I cut out from cotton fabric. It is better to cut out small images opposed to using a single piece of fabric to cover the whole shell. By doing this the pictures are small enough to sit on the shell edge and not awkwardly bubble or crease. I think it's important to use either paper or cotton fabric because these can easily decompose. 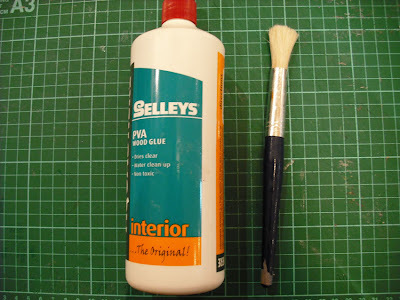 PVA Wood Glue: This is excellent to use and I highly recommend it over any other glue for this project. I chose PVA because this version is non-toxic and water soluble so it's environmentally friendly. 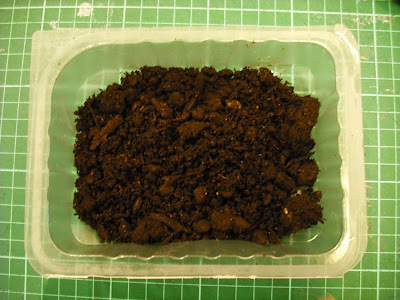 Soil: I used good old potting mix. 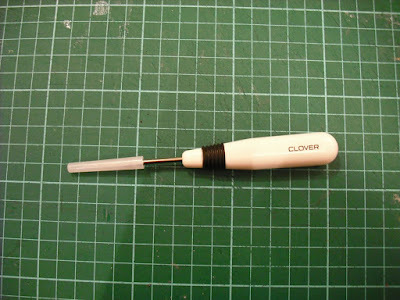 An awl: to make hole in bottom for drainage. 1. 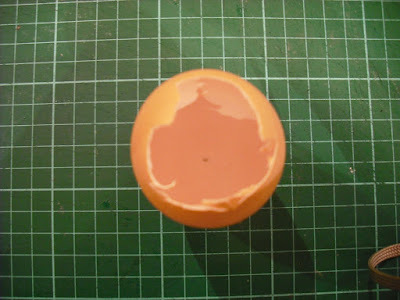 Use awl and put small hole in bottom of egg. I debated this for a while, unsure if I should or shouldn't. In the end, I decided the plants would be healthier with constant fresh water opposed to sitting in stagnant remains. It would also prolong the shells life. 2. 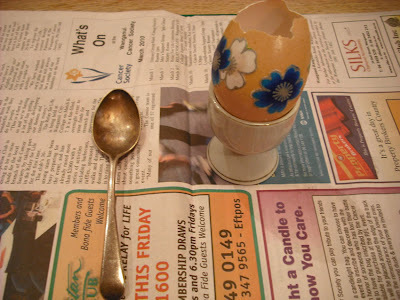 Coat the egg in PVA and place cut-outs on. 3. Cover the cut-outs in glue as well so they're firmly attached. Another good thing with PVA: it dries clear! 5. Use a spoon and put potting mix in egg gently! In two or three days they've got a root system. They look fresh and trendy. I also used Dizzy Lizzy a.k.a Impatients in my eggs. They do grow roots from cuttings but they're harder and 50% of my attempts died. That being said, the Impatients that survived looked terrific! (see image below). If you use Impatients snip off the flowers and only leave four to five leaves so that most of the plants energy goes into making a new root system. It takes about a week for an Impatient to "settle" in. If you run out of time I'm sure a garden center has something small enough to use like Pansies. When I give these away, I'll probably give my friends a segment of an egg carton so the egg remains up right while they get it home. 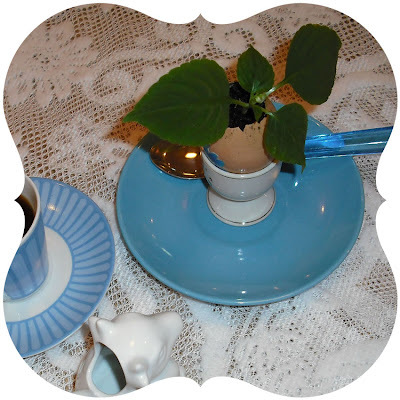 From there they can use an egg cup or just rest the Plantlet on a shot glass. 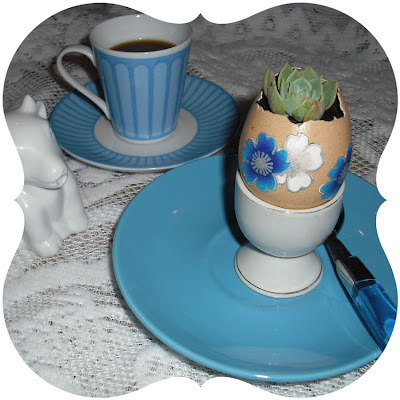 These plants require little attention after they've settled in the egg---especially the succulents. All they need is literally a few drops of water every now and then. When they do eventually get too big for their "pots" just crack the egg a bit and put straight in the ground or a new plant pot. Because I've used natural ingredients they will just merge with nature and the egg shell will become a fertilising package for the plant---even nature needs calcium. I can't wait to give them away! ..Thus eggs represent Christ and his new birth. Remember the reason for the season! Cute though. I'm way too busy (slash lazy) to bother with crafty things. Still, I'll like you to be a guest blogger on my site - although I'd prefer you to blog about fashion. Stef could do fashion and you do food? But I'd keep you to a word limit. A lot of blog surfers prefer the images to the reading part unless they really want to create what you did. .. cept that you look miserable? Really cool idea, I'll try this out when I get more eggs, whenever that is lol. So, when are you gonna finish your stories, your too good of a writer to leave them hanging?